Summary: "Sometimes the end is just the beginning. Especially if it means everything changes." First line: "This is how it starts: some hapless girl in a skanky little tank top lying on her back in the wet grass somewhere in Hidden Hills." Thoughts: I have to admit, what originally drew me to WHERE IT BEGAN was the cover. It's rather gorgeous, isn't it? Then, when I read the summary for WHERE IT BEGAN, I immediately knew this was a book I had to read. It sounded just like FORGET YOU by Jennifer Echols, which is one of my favorite contemporary novels. While I didn't love WHERE IT BEGAN as much as I thought I would, I still enjoyed the story and the concept behind it. The story starts off with the main character, Gabriella, waking up in a hospital, with no recollection of how she got there. She slowly begins to remember little things about her life but mainly remembers Billy Nash. Billy Nash, her "perfect" and gorgeous boyfriend who's apparently way out of her league. As the story progresses, it begins to drift from present tense, to past, and back again. I have to admit, this was my favorite part of the story. I liked finding out little details about Gabby's life and believe me, it is far from perfect. One thing I have to say, though, is I felt like the transition from present to past tense was a little awkward. With the way the story is written, it was hard to differentiate, especially between some of the conversations she had. Even in the present, they read as though she was explaining a past event. Plus, the overuse of "Gabriella Gardiner Presents Teen Life in the Three B's" before each flashback became a bit annoying. Even so, the plot definitely made up for it! What really kept me reading was the mystery behind what actually happened behind the night of, before, during, and after the car accident. I did guess what happened early on. Even though I figured it out, I still wanted details. Oh, and details I received! At certain times, I found the pacing to be a little slow, however, I did really enjoy how the story unfolded. Each character, whether main or secondary, played a role in the night of the accident, so be sure to play close attention! You don't want to miss any details. Let's talk about characters. I have to say, I was so sucked into the story that at one point, I pretty much disliked every single character. In the beginning, I found a lot of them to be extremely superficial, especially Gabby's mom. Gabby's mom focused so much on looks. I mean, even after the accident, with all of Gabby's injuries, she still tried to make the biggest problem the way Gabby looked. Heaven forbidden Gabby actually look like she's been in a car accident! GASP! Oh, and Billy. Don't even get me started on Billy. The sweet things they did together were not sweet at all. Gabby went completely out of her way for Billy, and I never really understood why. I get he's the hot popular guy, but he had the personality of a wet towel. Ugh! Some of the characters did redeem themselves in the end, in a completely unexpected way. Which ones, you ask? Well, you have to read it to find out. 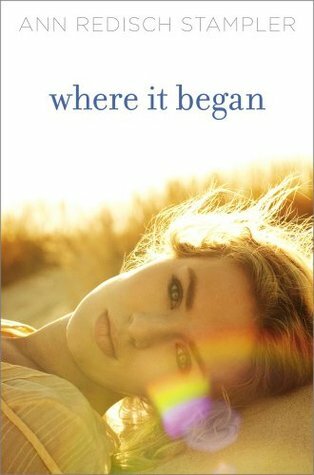 Overall, Where It Began is a complex, fascinating contemporary novel, contained with plenty of twist and turns. Although it had some minor flaws, I would still recommend it. The ending alone is worth the read! I have to agree with you, I'd never disliked characters so strongly before. The author did an amazing job setting that all up, I'd say lol. This has been collecting dust on my shelf for quite some time. lol I just haven't felt compelled to pick it up yet, even though I loved the premise of it. I guess I just haven't been in the mood yet. Thanks for the honest review. I look forward to reading it. ANd I swear the cover could pass for one of Jennie Haan's summer books. I've been looking forward to this book. Too bad you only "liked" it. I've heard really good things about the writing of this novel so I'm glad to have an ARC. Based on your points, I'm not sure I'll love this but at least I can give it a chance and see if it speaks to me. Thanks for the review! This book was recently brought to my attention by a friend, and like you, the cover caught my attention. Who is the model on this cover?